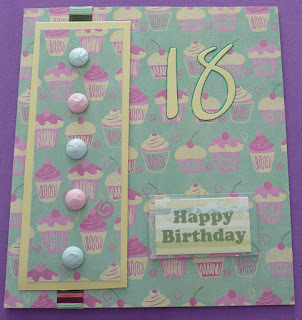 I made this card for my cousin whose birthday is on Sunday...then realised she is 19! I was thinking about the card for her sister who is 21 soon so I was just thinking "special birthday" steamed ahead and didn't realise until I wrote her name in it! So I've stuck some card over my writing and will save it for someone else! I love the cupcake paper which is from papermania Sweet Nothings. The 18 is from the Lipstick Love Letter Sizzlits alphabet.